After many years of work, all of the graphics, music, sound effects, and game logic for The Epsilon Outcome are finally complete. The game is now available for Windows platforms. Work is underway in getting it to run on Mac OS X. After that, there are intriguing opportunities for tablet support. This game features a look and feel that is novel in adventure gaming, and yet retro. Apart from some of today's advanced tools that were used to create the music (Ableton Live), record sound (TASCAM DR-07 Mk II) and put the game together (Adventure Game Studio), the game actually could have existed in the late 90's! The palettes for the 8-bit graphics were manipulated with a very old but good paint program called DeluxePaint II Enhanced, and the music was originally scored in Digital Orchestrator Pro. Thanks go to the people who worked on DOSBox so I could still run these favorite tools. Indeed, the real "soul" of the game comes from something fairly primitive and continually fresh: pen and paper. Over 375 drawings were made for all of the backgrounds and animations in the game. 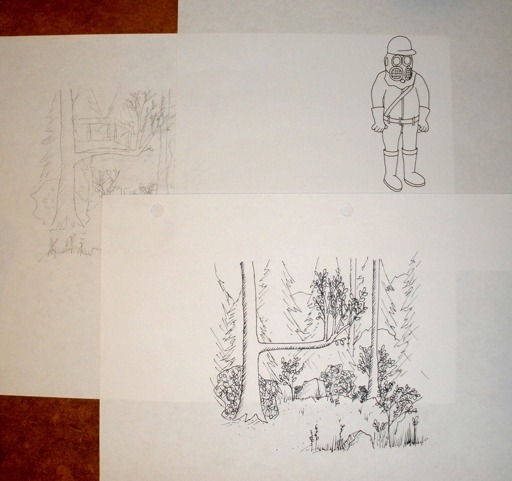 Drawings that were used in the final game.